Here’s a bag I made from charm squares. I bought a pack of 4 1/2″ charm squares from Iddy Biddy Cottage – oops. I just went there to get the link. The pack I bought is no longer listed but there’s a whole bunch of new themed packs of FQs, charm squares or strips. Oh dear. This is dangerous. 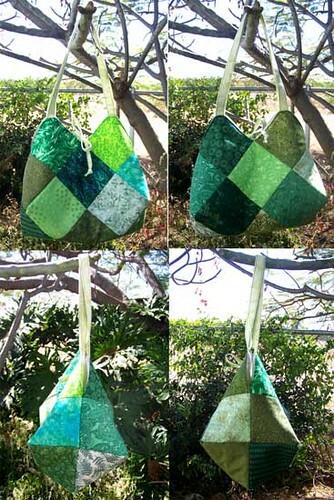 Then I used the tutorial from Mad Quilter to make this bag. Then I sent it to a new home!